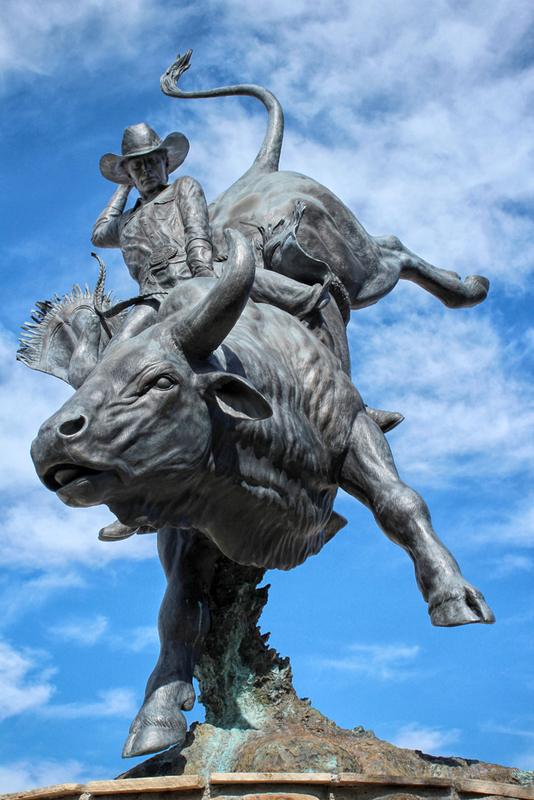 Event Details: An outdoor rodeo and western celebration held annually since 1897 in Cheyenne, Wyoming, USA. The event is one of the largest of its kind in the world and is held during the ten days centered around the last full week of July. 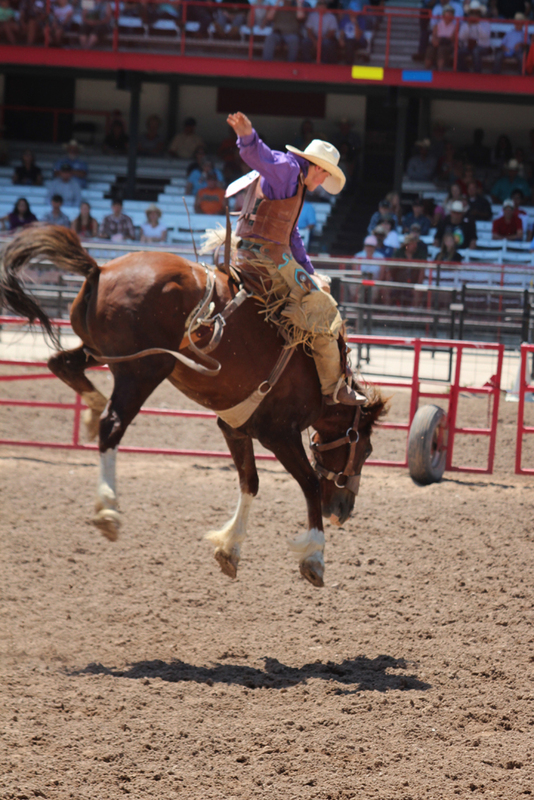 Before You Go: Check out the official page for Cheyenne Frontier Days and purchase your tickets well in advance! This is a popular event and you’ll want some flexibility in scheduling the events that you’re most interested in. Also check the schedule to see which days have a Grand Parade and try to schedule your visit for one of those days. Confirm the times for the Behind the Chutes Tour. Best Days for Photography: We think this event is great any day, but if you have the chance, try to attend twice – once early in the week (on a Tuesday or Wednesday) and once on the final weekend. Tuesday or Wednesday is great because the crowds are lighter and it’s easier to get photos in Frontier Town and the Indian Village without mobs of people in the photo. Plus, you’ll have more opportunity to talk to participants and snap photos. We love the final weekend because it’s BUSY and exciting! You’ll get great crowd photos, plenty of little cowboys, and rodeo finals! What to Bring: You’re only allowed to bring one bag, no larger than 14″ x 14″ x 14″. You’ll have to go through security checkpoints and show the contents of your bag at the Behind the Chutes tour and going through the gate to the Midway. We found two lenses particularly useful – one standard telephoto and one in the 70-300mm range. You will also want a lens hood and a tripod to use as needed. No outside food or beverages are allowed, but it’s particularly difficult to find options for vegetarians or other dietary restrictions, so eat a big breakfast and pack some snacks (granola bars, raisins, etc.) in your car if you fall into any of those categories. Bring plenty of sunscreen! Arriving: Plan to arrive early. We recommend arriving between 8:30-8:45 a.m. This will allow you to park at the Frontier Park lot. The cost is $10.00 per vehicle. Access to the park is via Warren Avenue or Carey Avenue from the south to Eighth Avenue. The reason why we like this parking area is because it’s easily accessible throughout the day. You can leave your tripod and extra gear in the car and pick it up whenever you need it. The Grand Parade: Check the schedule of events to see which days will have a Grand Parade. This is a great event to photograph! 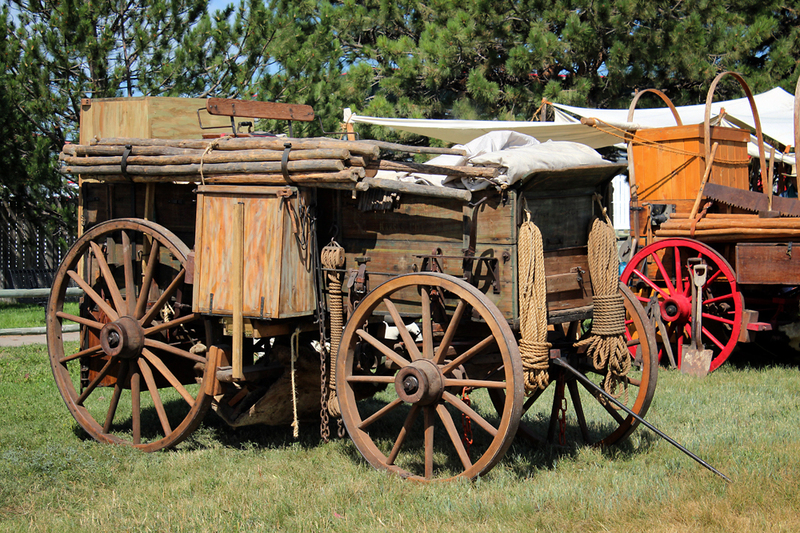 Various horse-drawn vehicles follow a route that you’ll also find on the Frontier Days site. 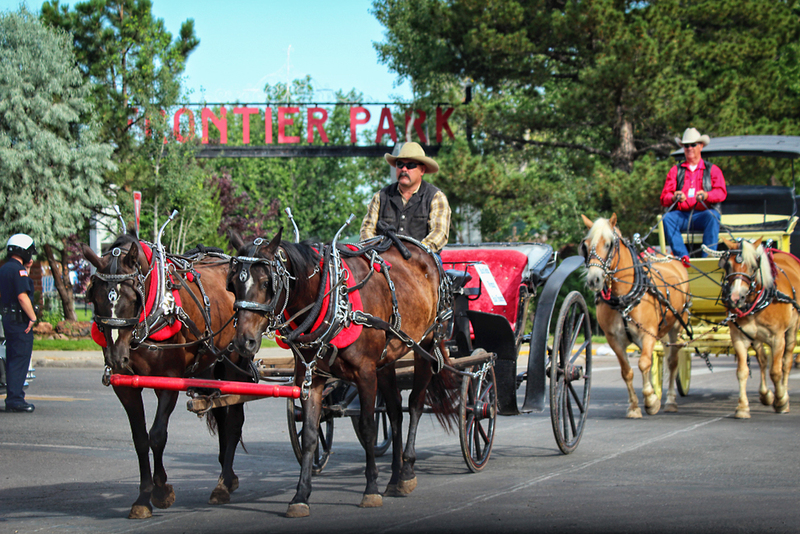 It’s a great way to get photos of the Wyoming Capitol building, but we also love to photograph the carriages from the corner of Frontier Park (Eighth and Carey Ave) You’ll get the Frontier Park sign in the background. If you want to get this photo, you’ll have to arrive there about 30 min. before the parade starts. If the parade starts at 9:30 a.m., you’ll have to be at this corner by 9 a.m. Luckily, it’s close to where you parked! 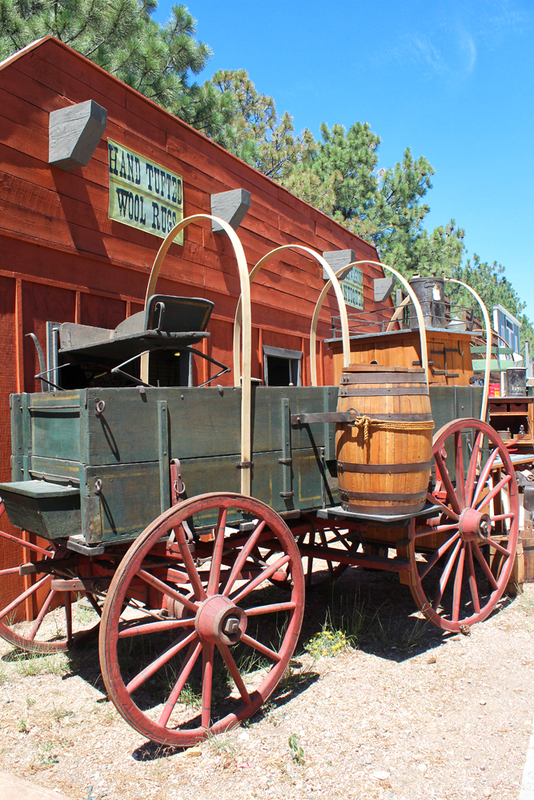 Behind the Chutes Tour: Once you’ve taken photos of the parade vehicles, head to the Old West Museum (at the corner of the parking lot) and look for a sign for the FREE Behind the Chutes Tour. 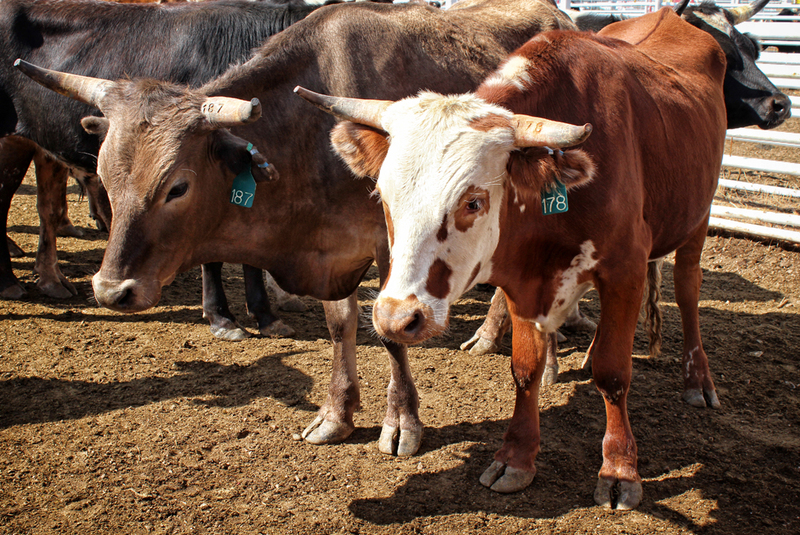 This tour gives you an opportunity to see what goes on behind the scenes of the rodeo. 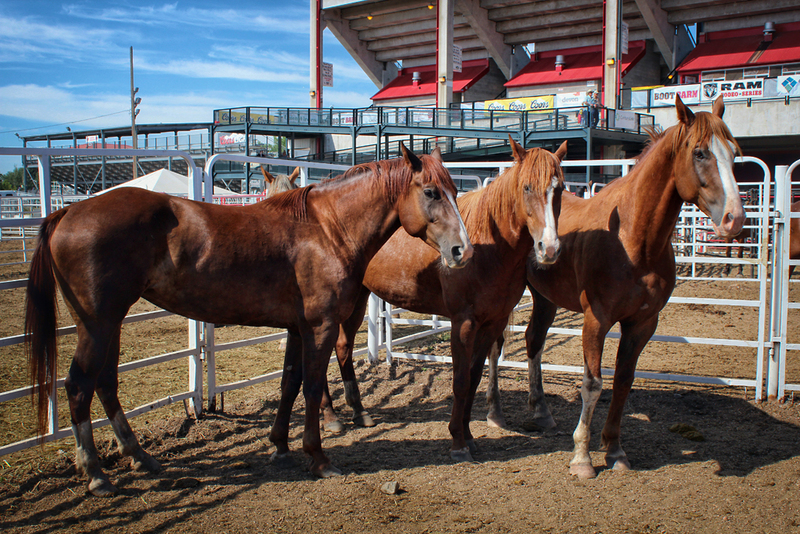 You’ll pass by pens of bulls and horses and have the chance to photograph an empty arena and chutes. 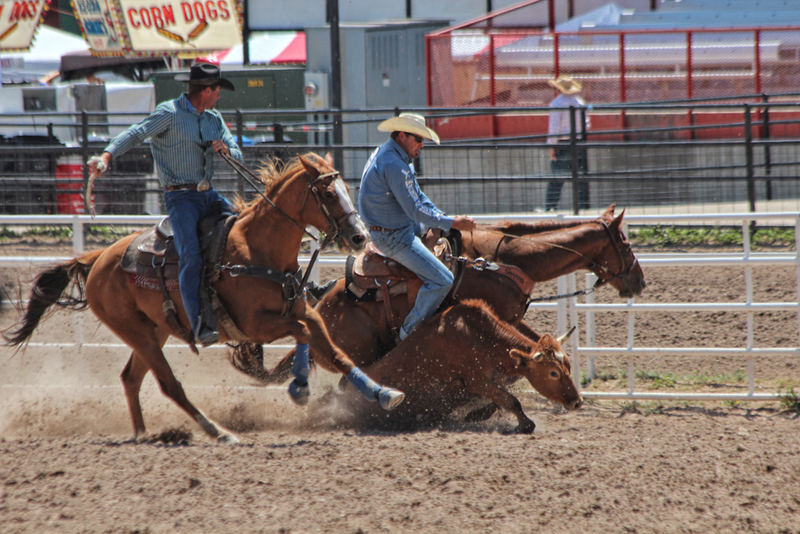 You’ll pick up some valuable information about the history of Cheyenne Frontier Days and get some insight into the rodeo itself. Be aware that the arena could be muddy, so wear sensible footwear. The Behind the Chutes Tour is about 45 minutes long and you’ll be walking about a mile. Note, however, that there are carts that make this accessible for everyone! And did we mention that the tour is FREE? Old Frontier Town: Once you exit the Behind the Chutes Tour, you’ll be ready to enter Old Frontier Town. This is a fun place that highlights Western merchants, craftspeople, and artisans. We like it early on a weekday because the light is nice and the crowds are light. Try visiting this on the final weekend and you’ll have a hard time standing still long enough to take a photo! 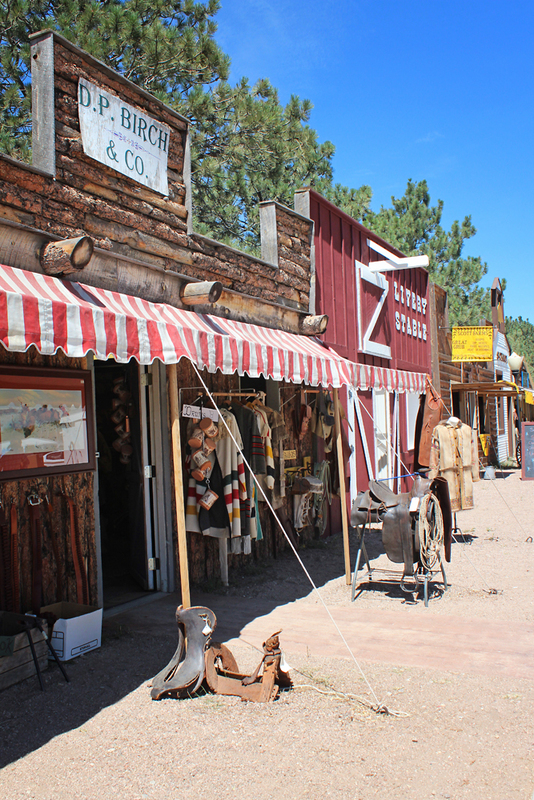 It’s worth wandering back here later in the day – merchants will have more elaborate displays and you may even see some special guest characters like Lillie Langtry, Buffalo Bill Cody, Wild Bill Hickock and Wyatt Earp. 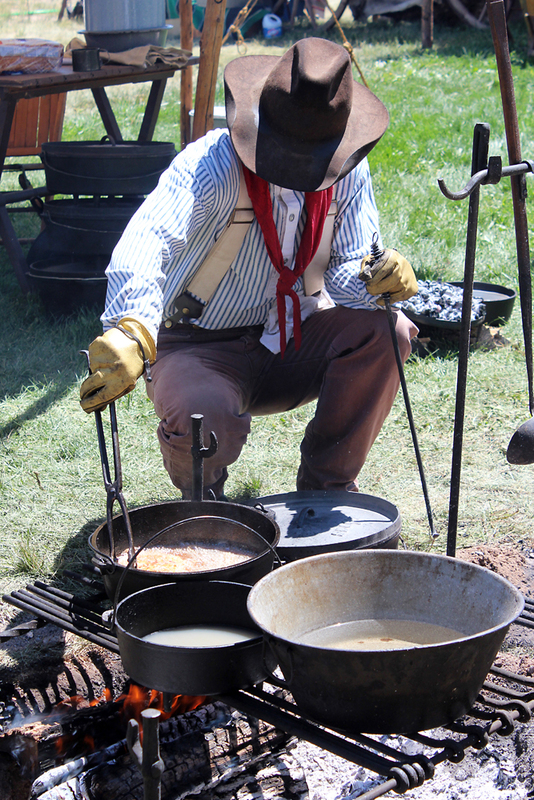 Chuckwagon Cookoff: Next, you’ll see some wonderfully authentic chuckwagon crews. These crews are competing in a cookoff where they are given a standard set of ingredients and judged on the foods produced and also on their wagon, tools and campsite. You’ll see these crews cooking throughout the day (they may even offer you a free coffee!) Everything about the chuckwagon cookoff area is picturesque. Our favorite time of day to photograph is early in the day (9-11 a.m.) and later in the day (5-7 p.m.) The light during this time is wonderful. Instead of shooting all of your photos from the walkway side, like most people do, try capturing some from the parking lot. You’ll get terrific photos of the wagons and details of the campsite with nice trees in the background. And if you’re shooting early in the day, very few people will intrude on your photos! Just be aware of traffic around you! We like the evening time because the fires are lit, food is cooking, and there is a lot going on in the camps! Evening is the perfect time to take your photos from the walkway. Indian Village: If you keep traveling along the walkway, you’ll come to Indian Village. At the entrance, there is a sign noting the dance times. Check your watch and see how much time you have before the first performance. You should have just enough time to head over to Will Call to pick up your rodeo tickets and take a few photos along the way. After that, head back to Indian Village. If you have time, take a stroll around the village, check out the beautiful work of the artisans, and photograph this area. The tipi area is private, but you’ll still be able to get some nice photos from a distance, and there is one set up for display as well. About fifteen minutes before the performance starts, find a seat in the center area. 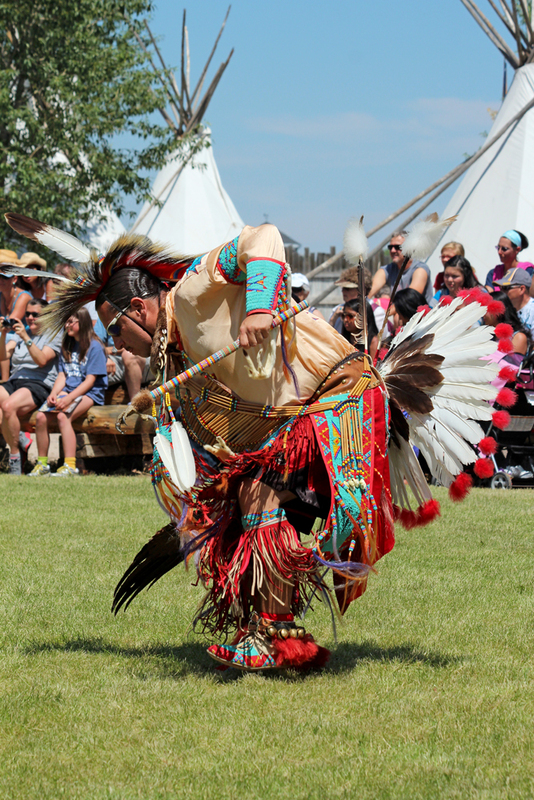 The dancers will be entering from the tipi side, so we recommend sitting in the front row somewhere near the opposite end. 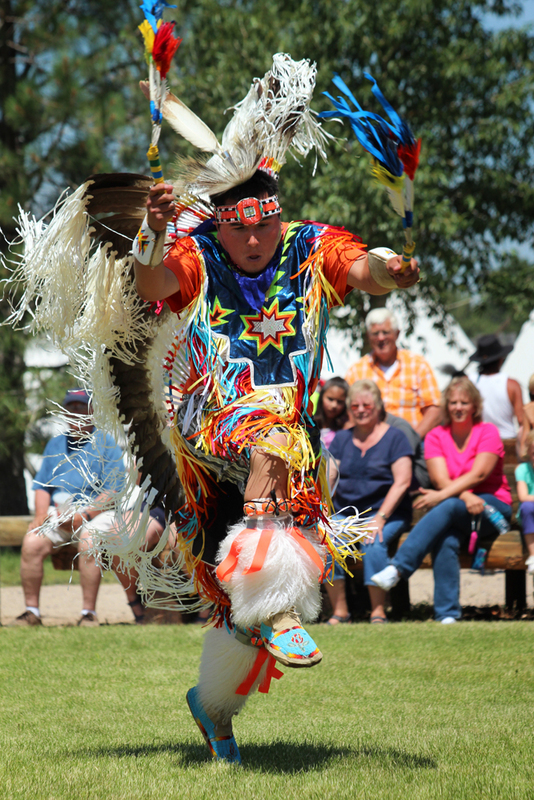 You’ll get great photos of the grand procession, when the entire group is present, and you’ll also be able to shoot individual photos with tipis in the background. This avoids restroom signs, as well as signs for the concessions, etc. 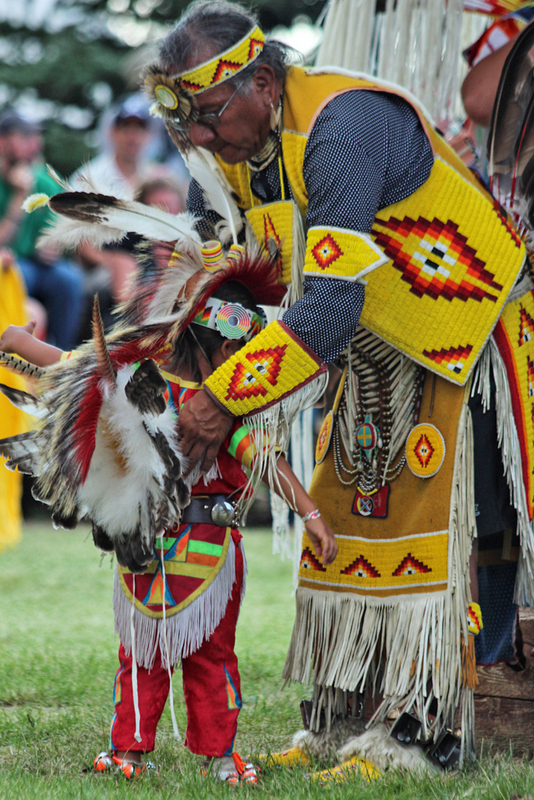 While you’re shooting the dancers, be sure to focus on details, such as the beautiful beadwork, as well as the overall picture. We particularly like closeup photos of the feet as they are dancing. Also try experimenting with shutter speeds so you can capture color and movement. Keep a close eye on the time … you probably won’t be able to photograph the entire dance performance before the rodeo begins, but we love the light during this early performance, and you’ll miss the next performance while you’re taking rodeo photos. Leave yourself fifteen minutes to get to the rodeo. 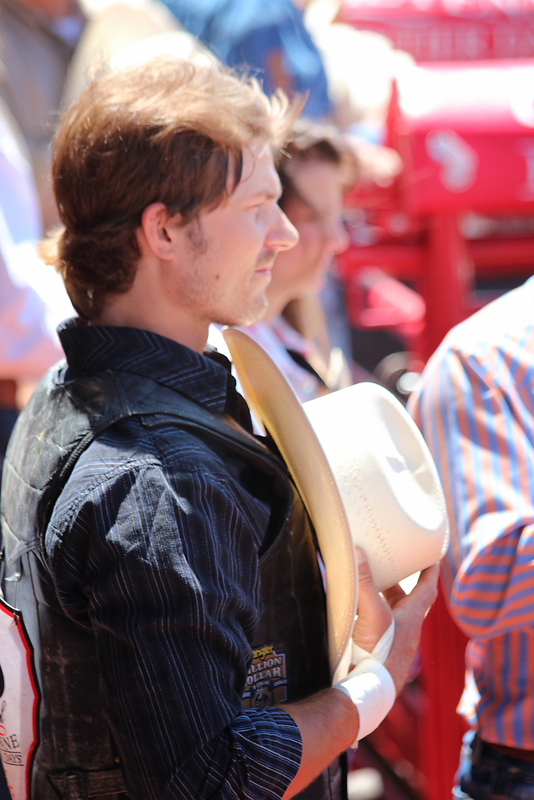 PRCA Rodeo: Now it’s time to head over to the day time rodeo performance. 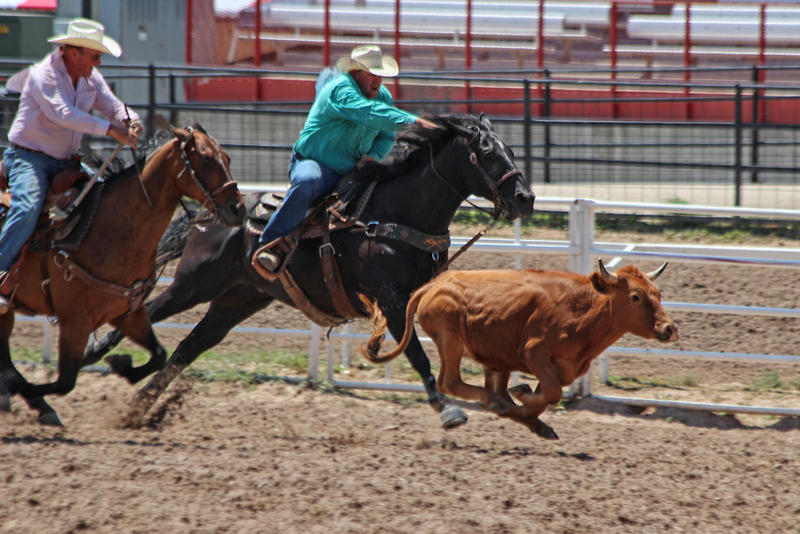 Not only is the light better during the day time show (without an extremely fast lens and high ISO speed, it’s difficult to capture a night time rodeo), but it’s also prohibited at night time because of copyright and PRCA restrictions, so enjoy the day time rodeo! 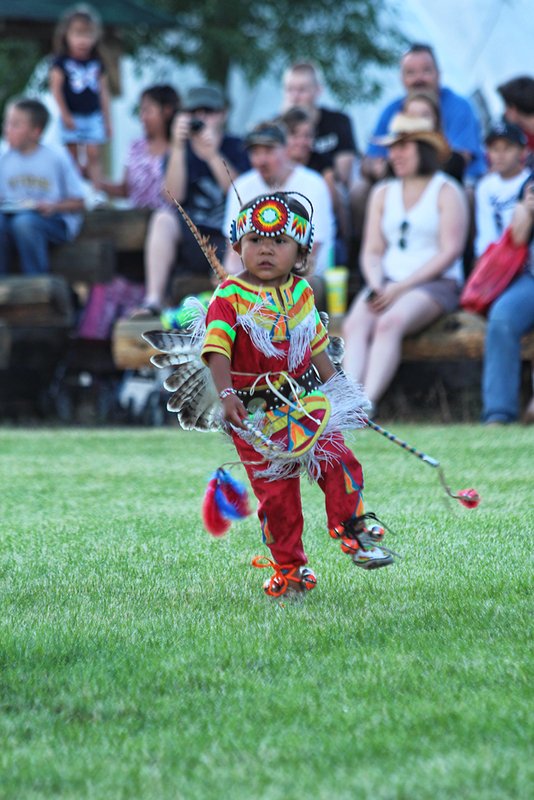 Note that any commercial use or distribution without the express written consent of Cheyenne Frontier Days is strictly prohibited. 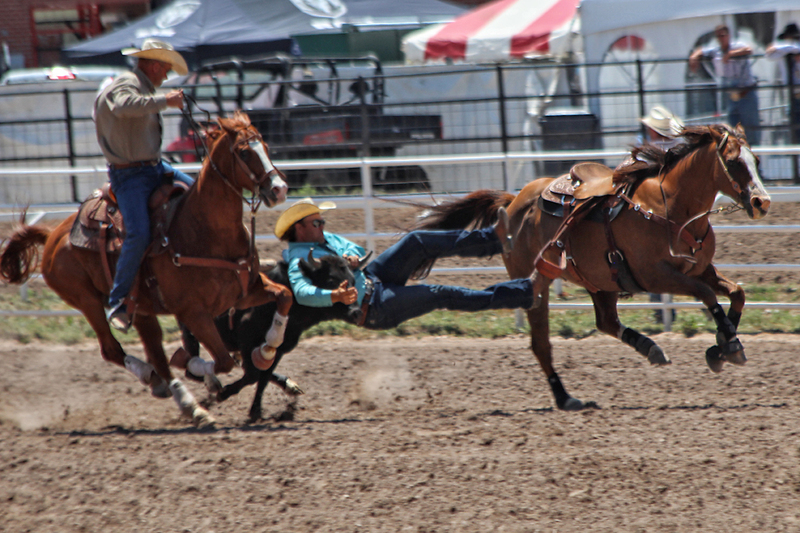 You may use photographs, videotape or digital images obtained from Cheyenne Frontier Days rodeo solely for private or personal, non-commercial purposes only. 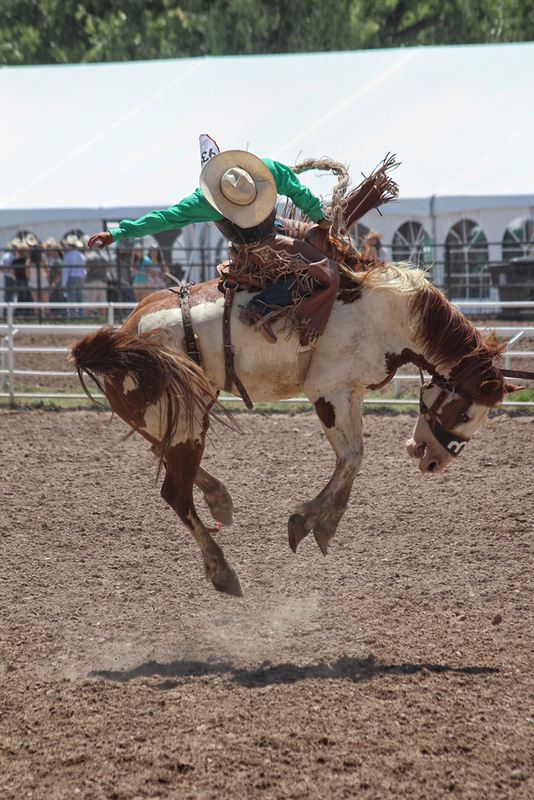 When you purchase your rodeo tickets, we recommend the East Side Lower Seating area. All of the action is on this side of the arena – you’ll also get great photos of the chutes, rodeo participants, and the animals. GA seating can also be great, but not a guarantee, especially if you spent the morning photographing the Indian dancers! On the way to your seats, be sure to take plenty of photos! You’ll see cowboys saddling up their horses, riders warming up, etc. As you climb higher in the stands, you’ll have a great view from above, looking down on the animal pens and everything that’s going on. The rodeo is approximately 3 hours long. Sitting in the East stands, you’ll be in direct sunlight. Be sure that you have plenty to drink and also, that you’re wearing sunscreen! If it gets really warm, the misters will be turned on. This will feel great, but it will definitely detract from your photos. So misters off = HOT, but great photos. Misters on = still hot, but many ruined photos. 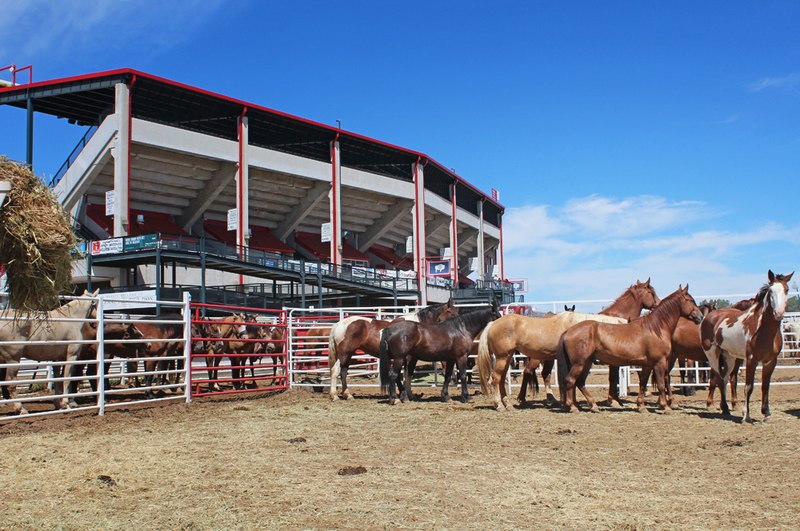 During the rodeo, most of the action will be happening directly in front of you (if you’re in the East stands) and also off to your left, where Chute 9 is marked. Use your longest lens and keep your shutter speed as fast as possible. You will definitely want a lens hood as the sun moves directly over you, and then in front of you. 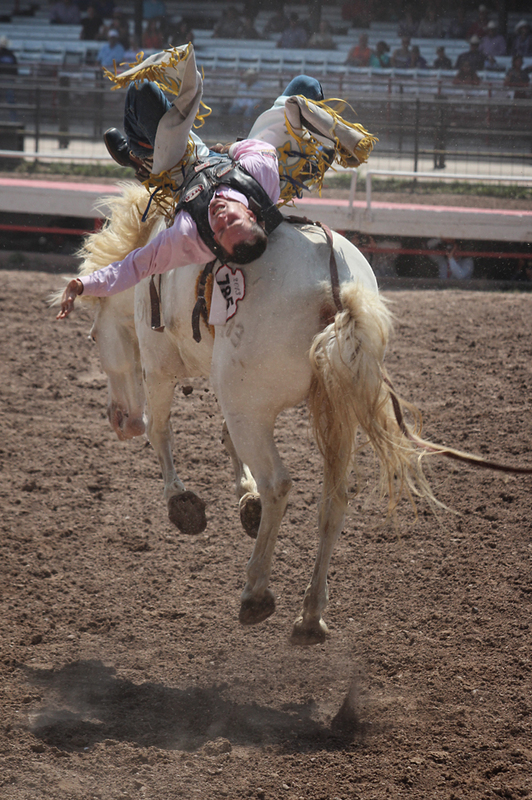 Depending on where you’re seated, you may have a difficult time getting photos of the bull riders – they generally don’t move far enough out into the arena to get a great shot from this side. We still think you get the best photos from the East stands though, and with a little patience, you may get some of the bull riders as well. Just be ready because if you’re able to get the shot, it’ll happen fast! 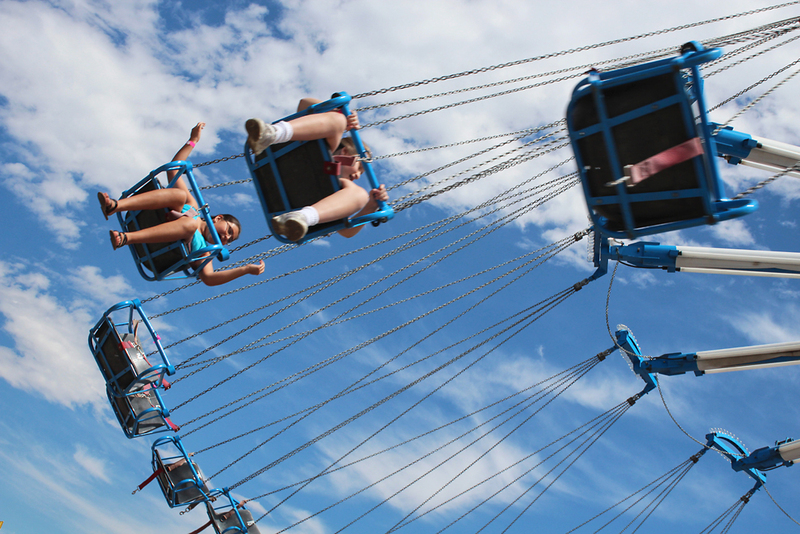 Carnival Midway: Once the rodeo is over, it’s a great time to wander over to the Carnival Midway. Your rodeo ticket is your gate admission for the day. If you’re hungry or thirsty, you’ll find plenty of concessions. You’ll also find Western vendors and artisans and a colorful carnival midway. There’s no shortage of things to photograph. Take detail shots and wide shots. If you want to leave this area and return later, be sure to get your hand stamped on the way out. 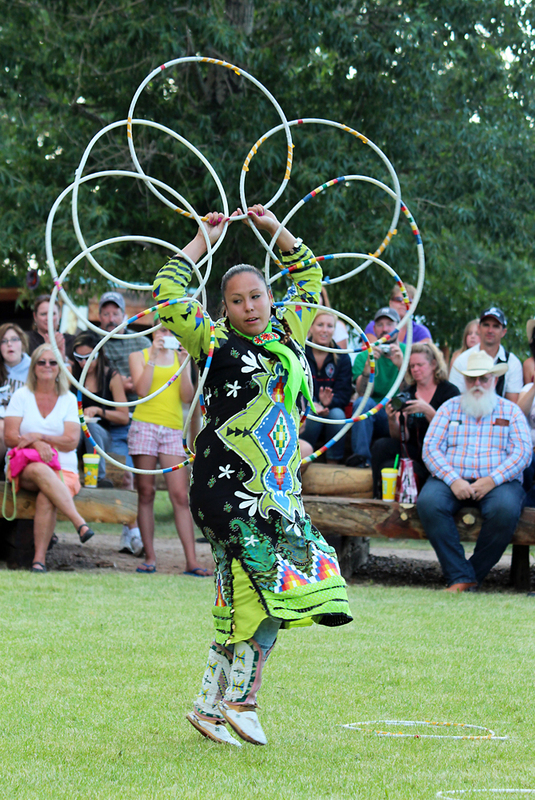 Rounding Out the Day: At around 5:00, head back over to the Chuckwagon area. Everyone is cooking dinner and it’s an exciting time to photograph! The utensils and cookware make great subjects for your photographs, as well as the people doing the cooking! Spend some time looking for interesting detail shots. 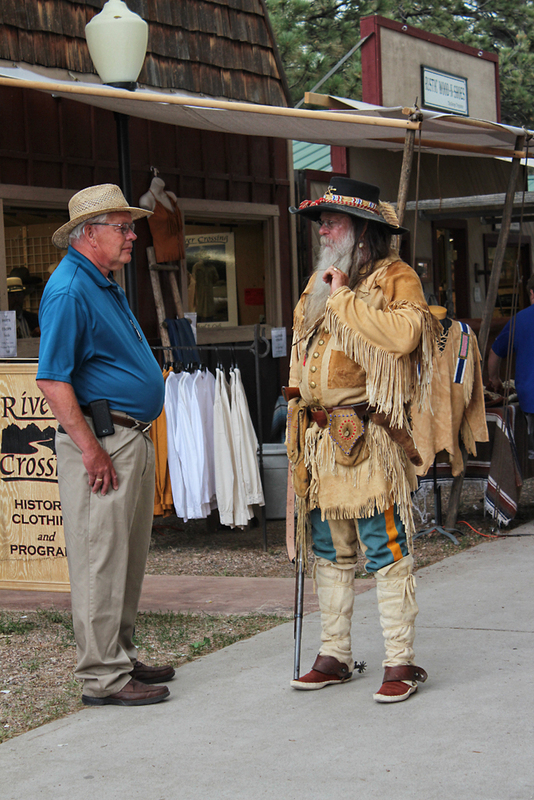 It’s also a great time to stroll through Old Frontier Town again. Finally, head back to Indian Village for the final dance performance. You may see a dance or two that you didn’t see in the morning, and the light is much different now. After this performance, we generally like to pack up our gear, but you could take night shots of the Carnival Midway if you still have room on your card! You’ll definitely need your tripod and a long exposure! 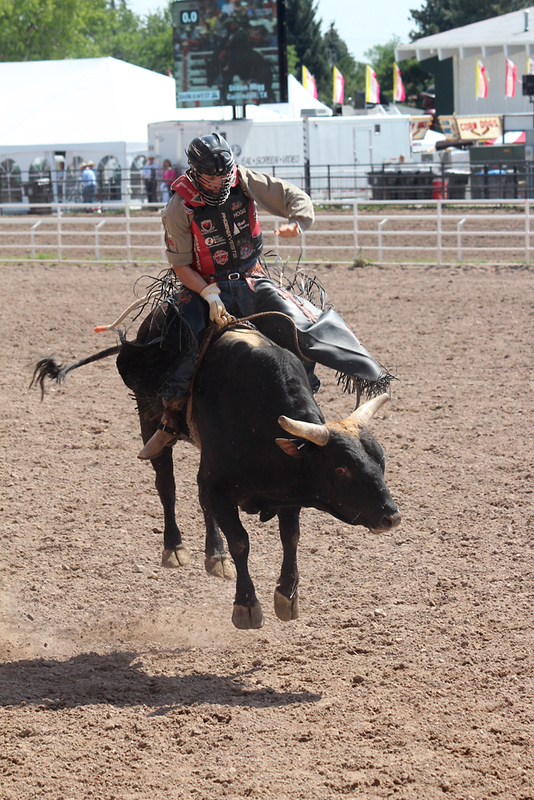 Cheyenne Frontier Days also provides a variety of night time rodeo and concert performances that you might enjoy!